Since the two races of Gremmeniella abietina cause different types of damage on different pine species, it is important to carefully identify the disease when the first symptoms are observed in a stand, plantation or nursery, as this will assist in determining the prognosis. In plantations, inspections must be carried out regularly, that is every 2 to 3 years, during the first 10 to 15 years after establishment. This makes it easier to detect infected buds that fail to open up when new shoots emerge. In nurseries, seedlings must be inspected as soon as the snow melts and regularly thereafter during the growing season.Molecular detection of G. abietina var. abietina significantly reduces the time it takes to analyse samples, compared with the conventional culture method, and it allows for the detection of infection in needles that are asymptomatic (Hamelin et al. 2000). This approach can be used to detect G. abietina and identify the race involved in just a few hours, and it is therefore useful for nurseries which have to deliver seedlings with a phytosanitary certificate. Prevention is the best control method for scleroderris canker (European race) (Laflamme 1991). In the case of nurseries and plantations alike, it is important to eliminate infected trees, hedges and other potential sources of inoculum in the surrounding area. This preventive measure is aimed at reducing the risk of an epiphytotic. This is very important for nurseries because all it takes is one infected seedling for a phytosanitary certificate to be suspended. The most widely recommended silvicultural method at present is complete pruning of the lower half of all trees (Laflamme 1999). Two thirds of the lower branches may be pruned out if the plantation's condition deteriorates. Pruning should be done at a height above the highest infection point (Laflamme 1999). Additional methods can be used depending on the age and health of the stands. All severely infected or dying trees should be felled. The pruned material can be left on the ground if there is no risk of it coming into contact with healthy branches. It is recommended that a branch-free zone of 60 cm be maintained to ensure that conidia (released from pycnidia) are not transported from infected twigs to healthy branches by rain splash. Pruning and the other measures that are implemented initially may turn out to be ineffective if sanitation follow-up is not provided in subsequent years. Recommendations for management measures may vary with the prognosis, which itself depends on the infection rate and severity as well as the mortality rate. Before taking any action, it is important therefore to carefully assess the condition of the plantation through monitoring (Laflamme 1991). Since the two races of G. abietina cause different types of damage to different species of pine, it is essential to properly identify the race involved. Once the disease is detected in a plantation, if no sanitation measures are implemented, the trees will sustain severe damage, which can ultimately lead to the loss of the whole plantation (Laflamme 1999). Chemical control is not an option for a plantation.Applying fungicide to seedlings in nurseries is a preventive measure for G. abietina var. abietina. A series of treatments applied from the time the new shoots emerge right through to the fall will reduce the incidence of scleroderris canker. However, this treatment is not a silver bullet, and seedlings sometimes become infected. More radical treatments have also been tested (more concentrated product, reduced frequency of application), but it is difficult to put them into operation (Laflamme 1991). Fungicide registered for use in Canada contain chlorothalonil as active ingredient. In vitro assays showed that Phaeotheca dimorphospora inhibits the growth of colonies of G. abietina var. abietina, making it a good candidate for biological control. The metabolites of P. dimorphospora are toxic to G. abietina var. abietina. In addition, this biocontrol agent produces several antifungal metabolites and it can establish itself in pine needles without causing symptoms or damage (Yang et al. 1995; Yang et al. 1993). It is not yet registered for use in Canada, however, and no product formulation exists, nor has a mode of application been developed. 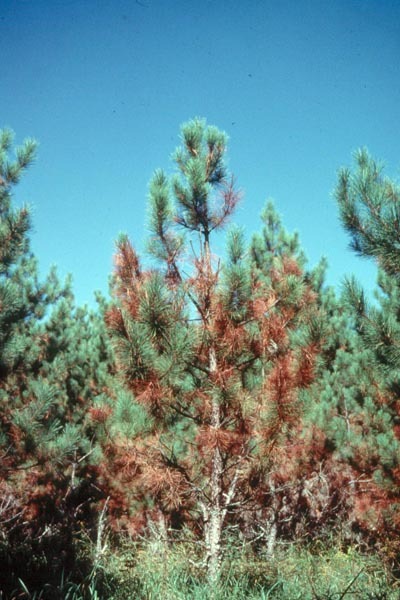 Selection of disease-resistant pines is a long-term management strategy. Lodgepole pine (Pinus contorta) and jack pine (Pinus banksiana) have natural resistance to the European race of G. abietina var. abietina (Laflamme and Blais 2000; Laflamme et al. 2006; Simard et al. 2001). However, these two pine species are not as valued as red pine and they can be carriers of the disease. Avoid hazard zones and do not use susceptible species in the production of new nursery stock or in the establishment of new plantations. Do not plant pines in areas where the snow cover lingers in the spring, since snow creates conditions favourable to the production of inoculum. Eliminate infection centres in the area around plantations and nurseries. Inspect seedlings and pine trees on a regular basis. Carefully identify the race of Gremmeniella abietina when the disease is detected because the treatment approach tends to differ for the two races. Apply preventive fungicide treatments to seedlings grown in nurseries, at the recommended rates, throughout the summer. Prune half or two thirds of the branches on all pine trees under 15 years of age in the plantation. Be sure to conserve a 60-cm area without branches between the pruned branches and the residual green crown. Prune trees back even more if the disease is present. Cut down all trees with severe disease symptoms. Monitor plantations over a period of several years and carry out more pruning if necessary. Agence canadienne d’inspection des aliments. 2005 Chancre scléroderrien. http://www.inspection.gc.ca/francais/plaveg/pestrava/greabi/greabif.shtml consulté en janvier 2008. Direction de l'environnement et de la protection des forêts. [SD]. Le chancre scléroderrien. http://www.mrn.gouv.qc.ca/forets/fimaq/controle/fimaq-controle-insectes-chancre.jsp consulté en janvier 2008. Hamelin, R.C., Bourassa, M., Rail, J., Dusabenyagasani, M., Jacobi, V., and Laflamme, G. 2000. PCR detection of Gremmeniella abietina, the causal agent of Scleroderris canker of pine. Mycological Research 104(5): 527-532. Laflamme, G. 1991. Le chancre scléroderrien des pins. Forêts Canada, Re´gion du Que´bec, Feuillet d'information CFL 3, 13 pp. Laflamme, G. 1999. 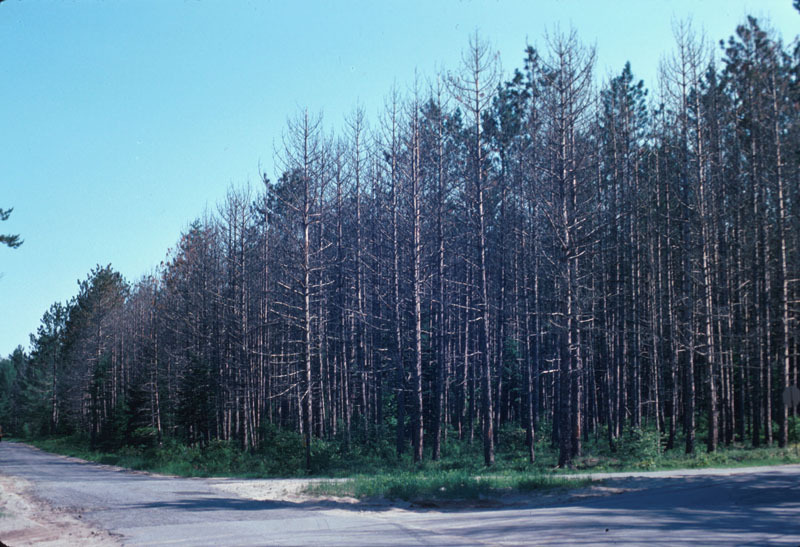 Successful control of Gremmeniella abietina, European race, in a red pine plantation. ; Traitement réussi d'une plantation de pins rouges affectée par le Gremmeniella abietina, race européenne. Phytoprotection 80(2): 55-64. Laflamme, G., and Blais, R. 2000. Resistance of Pinus banksiana to the European race of Gremmeniella abietina. Phytoprotection 81(2): 49-55. Laflamme, G., Rioux, D., Simard, M., Bussières, G., and Mallett, K. 2006. Resistance of Pinus contorta to the European race of Gremmeniella abietina. Forest pathology (Journal de pathologie forestière) 36(2): 83-96. Simard, M., Rioux, D., and Laflamme, G. 2001. Formation of Ligno-Suberized Tissues in Jack Pine Resistant to the European Race of Gremmeniella abietina. Phytopathology 91(12): 1128-1140. Skilling, D.D., Schneider, B., and Fasking, D. 1986. Biology and control of scleroderris canker in North America. USDA Forest Service research paper NC North Central Forest Experiment Station; 1986 (275). Yang, D., Laflamme, G., Bernier, L., and Dessureault, M. 1995. Phaeotheca dimorphosphora as a potential biocontrol agent for shoot blight caused by Gremmeniella abietina. Canadian Journal of Plant Pathology 17(1): 7-12. Yang, D., Plante, F., Bernier, L., Piche, Y., Dessureault, M., Laflamme, G., and Ouellette, G.B. 1993. Evaluation of a fungal antagonist, Phaeotheca dimorphospora, for biological control of tree diseases. Canadian Journal of Botany 71(3): 426-433. 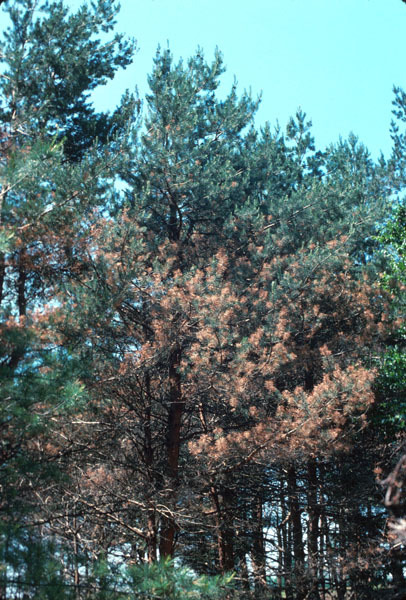 Red pine infected with the European race of Gremmeniella abietina, the cause of Scleroderris canker.